Baking soda is one natural remedy with a long list of health benefits and an endless list of uses. It can be taken internally by mixing with water. Baking soda can also be applied topically and used orally. While baking soda has many beneficial effects when ingested, it should also be used with caution as it is high in sodium. Those with sodium-restricted diets should not take baking soda internally. Taking sodium-bicarbonate by mouth may also cause problems for people with liver disease, edema, kidney disease, and those with high blood pressure. Internal use of baking soda may also be unsafe for pregnant and nursing women. If you are uncertain of whether or not use of baking soda will be safe for you, it is always recommended to consult with a doctor first. Also, keep in mind that the following health benefits and uses apply to baking soda, but not baking powder which is a totally different substance. Furthermore, many commercial baking sodas contain aluminium or other impurities. As an all-natural remedy, always be sure to use pure sodium-bicarbonate. Want to purchase some pure baking soda? The best place to buy it is from this page on Amazon – which offers a choice of buying a 1 lb bag all the way up to a 50 lb pail. After discovering the endless list of baking soda uses, you might even be tempted to opt for the 50 lb pail! Due to its alkalinity, baking soda may be taken internally to neutralize stomach acid and prevent heartburn or indigestion. Baking soda also helps to break down fatty foods and make them easier to digest, further reducing stress in the stomach and intestines. To use baking soda as a digestive remedy, simply dissolve one teaspoon soda with 8 ounces of warm water and drink. Repeat as necessary once every two hours until symptoms pass. Baking soda is also an effective natural remedy for parasitic worms which can infest the digestive tract. Before bed, dissolve a quarter teaspoon of soda in warm water and drink. Repeat every night for three days to remove parasites from the body. An important function of our kidneys is to correct acidity in the blood stream by producing alkaline bicarbonate. A dose of 600 – 1800 mg of baking soda per day can work wonders to increase the body’s pH and relieve stress on the kidneys. Try these Rugby Sodium Bicarbonate 10 grains tablets for easy dosing. Because sodium bicarbonate naturally reduces acidity in the body, drinking a teaspoon of baking soda dissolved in water can help to alleviate the burning sensation and frequent urge to urinate caused by a urinary tract infection. Note that this remedy treats symptoms only, but won’t cure the infection by itself. Consult a health care professional for infections lasting more than a couple of days. Over-consumption of meat and dairy products, processed foods, and acidic sodas can easily cause the body’s pH to drop below safe levels. This illness, known as acidosis, can lead to many serious health conditions including kidney disease, loss of bone density, and pancreatic malfunction. A daily dose of alkaline sodium bicarbonate (600 to 1800 mg) may help to counter the effects of acidosis and bring the body’s pH back up to normal neutral levels. Our bodies produce lactic acid – the substance responsible for the burning sensation in muscle tissue – when there isn’t enough energy available to fuel our muscles during an intense workout. Taking baking soda can help to impede lactic acid build-up and improve physical endurance during a workout. About ninety minutes prior to a workout, drink half a teaspoon of pure sodium bicarbonate dissolved in about 4 cups of water. Optionally, you can add a moderate amount of natural sweetener and a couple spoonfuls of citrus juice to flavor this pre-workout beverage. Sodium bicarbonate has been shown to be effective for inhibiting the formation of uric acid crystals by lowering the pH of urine. If you are prone to gout pain and inflammation of the joints, try taking a teaspoon of baking soda dissolved in water after a big meal to prevent future flare-ups from occurring. Sodium bicarbonate is naturally antiseptic, making it a great natural cleanser for frequently used personal hygiene items like toothbrushes, hair brushes, and even shoes. Mix 4 ounces of water, 2 tablespoons of white vinegar, and 2 teaspoons of baking soda in a small glass. Soak toothbrushes in the mixture for half an hour or more. For hair brushes, simply multiply the recipe until you have enough of the mixture to cover the head of the brush. Sprinkle baking soda in shoes when you take them off at the end of the day to kill odor-causing germs. To speed recovery of cold and flu symptoms, mix about a quarter teaspoon each of salt and baking soda in 8 ounces of warm water. Use a bulb syringe or Neti pot to rinse nasal passages with this mixture. The minerals in the water will help to reduce bacteria populations and clear up congestion from your nose and sinuses. Gargle with this same mixture to ease a sore throat and help clear mucus and bacteria from the throat and mouth. Use baking soda to create your own homemade all-natural deodorant. In a small resealable container, mix 2 ounces of pure aluminum-free baking soda, 2 ounces of cornstarch (or arrowroot powder if you have it), and 5 tablespoons of organic virgin coconut oil (also naturally anti-bacterial!) Optionally, you can add a few drops of essential oil for fragrance. Tea tree oil, for example, would be a great choice due to its anti-microbial properties and refreshing scent. Brushing your teeth with baking soda can help to remove stains and keep your pearly-whites… well, pearly! Mix 2/3 cup of pure aluminum-free baking soda with one level teaspoon of fine ground sea salt and add water until your mixture reaches toothpaste consistency. Optionally, you can add around 10 drops of peppermint oil or a teaspoon of peppermint extract for flavoring. Do this before you mix in the water so your paste doesn’t become too thin. Use baking soda to create your own homemade all-natural rinse that is both inexpensive and great for your mouth health. Simply mix about half a teaspoon of baking soda in 4 ounces of warm water. Gargle and swish for up to a minute then spit it out. Follow up with a rinse of cool water to remove the salty taste and grit from your mouth. As with baking soda toothpaste, you can add an optional drop or two of peppermint for flavoring. Mix baking soda with a little bit of warm water to form a facial mask. Apply to areas affected by pimples and massage gently into skin. Allow the mixture to soak in for up to an hour then rinse with warm water. The baking soda will help to cleanse your skin and reduce inflammation of pimples. If you have problems with blackheads, try cleansing with baking soda. Mix up a paste of baking soda and just a small amount of warm water. Apply to blackheads and let it dry for about ten minutes then rinse with lukewarm water. The baking soda should remove most of the debris from clogged pores. Repeat as necessary, up to once every other day. Sodium bicarbonate crystals can be used to exfoliate skin, promoting the growth of new tissue. If you have acne scars or other imperfections you’d like to get rid of, mix a few teaspoons of baking soda with a bit of warm water to form a paste. Apply by massaging into skin and let it soak in for at least ten minutes. Rinse with lukewarm water and follow up with a natural moisturizer and repeat about once every other day to clear up skin and fade blemishes. Remove contaminants like oil, dirt, styling product build-up, and chlorine residue from your hair and scalp by washing with baking soda. Add around 4 tablespoons of pure aluminum-free baking soda in a 16 oz bottle of warm water. Shake well and use to wash hair in place of shampoo, follow up with an apple cider vinegar rinse, then condition hair with an all-natural moisturizer like coconut or Argan oil. Because fungus needs an acidic environment to flourish, alkaline baking soda actually prevents toenail fungus from spreading by creating an uninhabitable environment for it. Sodium borate, commonly known as simply borax is a naturally occurring mineral that is also a powerful fungicide. These two combined create a remedy that can cure nail fungus fast. Mix equal parts borax powder and baking soda with just enough water to form a paste. Wet feet and gently rub the mixture onto infected nails. Do this twice daily and continue for at least two weeks after fungus appears to have cleared up. Sodium bicarbonate is excellent for neutralizing foot odors and also works great to help treat fungal infections of the feet. Mix up a healing foot soak by adding about 4 tablespoons of soda to a quart of warm water. Soak feet for ten minutes to loosen dead skin, cleanse away contaminants, and relax sore tissues. Add about 10 drops of an essential oil like lavender or tea tree to increase the healing and relaxing potential of your foot soak. Not sure what to do about that smelly old rug by the back door? Just sprinkle liberally with baking soda, let it sit for several minutes, then vacuum it up. This trick works on upholstery, too! Try sprinkling baking soda on floor rugs and seats the next time you clean inside your vehicle. Eliminate lingering odors from the refrigerator by placing a freshly-opened box of baking soda inside. Try adding a few drops of essential oils to the baking soda to add a pleasant aroma to your natural fridge-freshener. Sprinkle baking soda into the bottom of your kitchen trash bin to banish that funky smell. Another use for baking soda is to create your own all-natural homemade air freshening spray. This product is so easy and inexpensive to make that you’ll never want to buy it again. 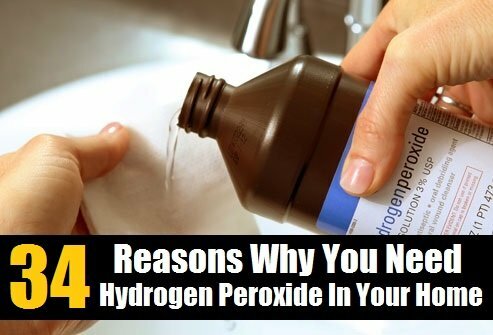 Also, try the same technique to naturally clean out toilet bowls, sinks, and any other hard surface in your bathroom! Use baking soda and water to clean out your oven without having to scrub until your arms are sore. Check out the How-To on LiveRenewed.com. Also, when using this technique, you can substitute a balled up piece of used aluminum foil in place of a rag or sponge. Aluminum is a great alternative to other abrasive materials for removing stuck-on food, but it’s also soft enough that it won’t damage most surfaces. Want to get your whites whiter and your colors brighter without having to worry about bleach or other dangerous chemicals? Try making your own homemade Castile soap and baking soda laundry detergent! Simply dissolve 1 cup of baking soda and 1/3 cup of salt in 2 cups of warm water. Then pour the mixture into a clean empty one gallon container. Add 1 cup of liquid Castile soap and top off with water. Just 2 ounces (that’s 1/4 of a cup) is enough detergent to wash a full load of laundry. Baking soda is a wonderful natural ingredient that should be in every home as proven by these 24 incredible baking soda uses. If you want to start using baking soda in your home, in your beauty regime and for the wonderful health benefits, then you can purchase many different quantities from this page on Amazon.